Following on from my last post, where I noted the absence of Western Hanover as a damsire of commercial sires, this time I look at our local sires and see where the damsires are coming from. Once again, there is a big name almost totally missing – In The Pocket. 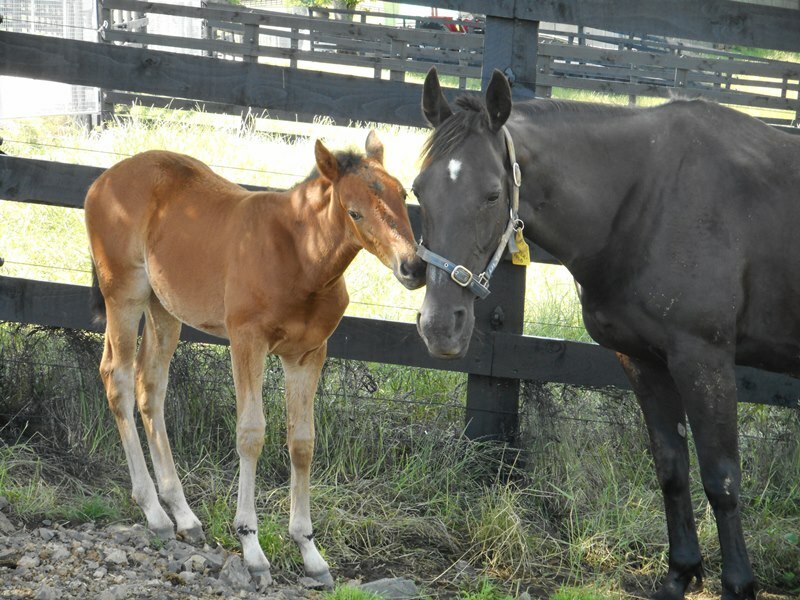 In The Pocket, a super son of Direct Scooter, was the southern hemisphere equivalent of Matt’s Scooter, and he did a similar remarkable job as a sire of speedy sons and daughters. But unlike Matt’s Scooter, so far In The Pocket’s influence on New Zealand sires is very much as a sire of sires (Changeover, Christian Cullen, Courage Under Fire) rather than as damsire of sires. To date there is only one sire standing with In The Pocket as his damsire, and that is Tintin In America (by McArdle). That surprises me, given In The Pocket’s record as a sire here over such a long period. There is also one sire with Christian Cullen (top sire and son of In The Pocket) as a damsire, and that is Highview Tommy (by Bettor’s Delight). There’s several reasons why I would love to see more of In The Pocket in the damsire role of our locally bred sires. He was a horse not only known for his speed and determination, but also his heart. Whether or not you totally agree with the “x factor” theory of Marianna Haun, there does seem considerable evidence to show that a larger heart may be passed on the x chromosome, i.e. 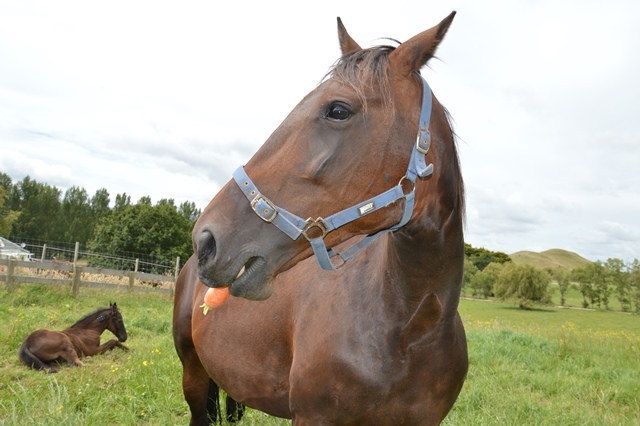 able to be passed from a male horse to his female progeny but not to his male progeny. If this is the case, then one of the most important qualities of In The Pocket will be able to be passed on to a sire when he is in the maternal line. In the Northern Hemisphere, this role has been picked up by Matt’s Scooter (as well as him being a sire of sires). He is a key element in the maternal line of some of the good sires coming through – American Ideal of course, but also Shadow Play and Well Said. Becoming a successful sire is very hard. Becoming a sire of sires is almost impossible. Becoming an important damsire of sires is also a mountain to climb, or rather a totally different and more technically difficult face of the same mountain perhaps. I hope Tintin In America can advance his cause in that regard, and I also hope In The Pocket gets more chances in the future as a damsire of champion sires. We need him in the “engine room” of more of our sires – the the back pocket where we like to keep our reserves of cash. Western Hanover is almost totally missing from the maternal line of sires. In fact the only sire available here with Western Hanover as his damsire is the Canadian newcomer Prodigal Seelster (Camluck x Platinum Seelster). Apart from him, the closest we get is A Rocknroll Dance whose bottom maternal line is the same as Western Hanover’s (and same for the sire Modern Art in Australia). Since we get access to many of the top international sires now, the absence of Western Hanover so far as a damsire of top sires seems to be a phenomenon wider than just New Zealand. On the other hand, Artsplace is already the damsire of Well Said and Rock N Roll Heaven, and in New Zealand also two lower tier but interesting newcomers Raging Bull and Net Ten EOM. Beach Towel was also born around the same time as Artsplace and Western Hanover and has damsire credits for Somebeachsomewhere and our own Sir Lincoln. And Matt’s Scooter, only just a few years older than Artsplace and Western Hanover, is the damsire of American Ideal and Shadow Play. Falcon Seelster was renowned as a sire of good broodmares, and he has managed damsire credits for Art Official, and for New Zealand-bred sires Ohoka Arizona and Charles Bronson. So the lack of Western Hanover in the damsire position of top stallions is really intriguing. His own sire No Nukes has proven really potent in the maternal lines of sires. So why not Western Hanover himself? It’s almost as if his whole legacy is concentrated as a sire of sires. Have I missed something? What do you think the reason is? Is there anything on the horizon to change that? Seasons greetings to all b4breeding blog readers. 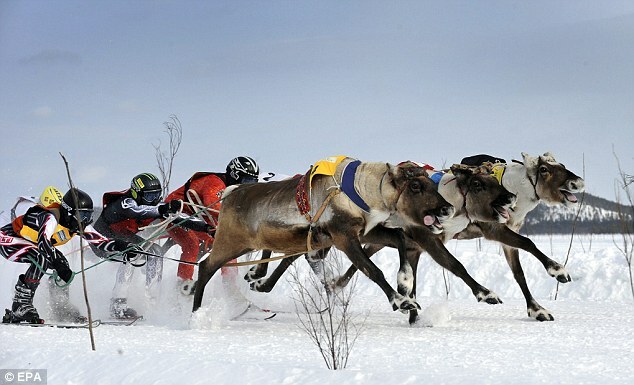 If you can’t believe your eyes, just google “reindeer racing”. Have a wonderful Christmas and New Year, and a successful and happy 2015. Stallions and mares have different rules? The answer is: YES. Stallions and mares have different rules. What I am less sure about is the WHY. Sure, when it comes to racing I know it needs tougher and exceptional fillies and mares to step up to compete in the best classes – and it can be done. But when it comes to breeding, I believe the only reasons for separate rules for the males and the females is for the health of the horse, the impact on the overall industry, and the ability for those investing ( the breeders) to get a fair go at a return. That’s why I read with a lot of interest the American newsletter Harness Racing Update which talked about the mixing of siring duties with a horse that continues his racing career. As the article said (and it is a good article, well written and reasoned) there are many horses in Europe who have done this for years, and in North America the penny is just starting to drop. You can have a bet each way, if the stallion is able and willing and managed correctly. I really like that idea, as it keeps great male horses racing (with an added incentive to keep proving their worth) and it allows those slightly-less famous horses with great breeding and/or performance a chance to prove their worth in the breeding barn. So…why is there the resistance to mares doing the same? The resistance to embryo transfer has been (still is?) 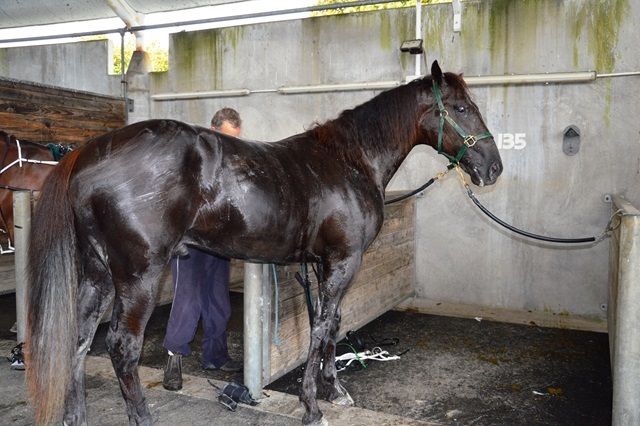 enormous and bureaucratic compared to the freedom stallions now have to race and breed at the same time. It is regarded as something almost scandalous to take an egg off a racing mare. If our champion mare of today Adore Me used a surrogate mare to breed a foal while she raced on, how would you feel about that? Now compare that to how you feel about a champion stallion having a go at siring in his off season with 20 or more mares. It’s about transferring sperm and eggs. It’s not rocket science. The rules changed when AI was approved. And the rules need to be reviewed in the light of the current industry’s future. 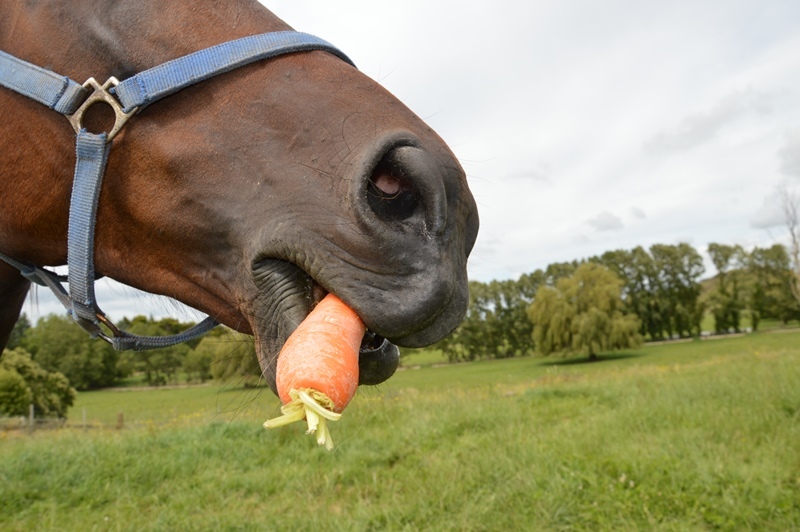 The focus needs to be more on industry needs and horse welfare, than the ideological resistance of some people based on – how do I say this politely? 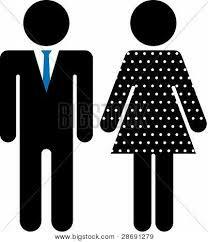 – prejudice that may be a remnant of our own human struggle with inequality among the sexes. Another example is the ability of a sire, via artificial insemination (AI) to cover in theory many hundreds of mares across a range of countries. Whereas a mare (although accessing a number of sires potentially), must settle on one stallion – you hope – to get pregnant during one season. Isn’t this a form of wastage, when compared to the stallion’s options? A while back I floated the idea of a mare being able to get more than one foal per season via surrogate mares. It was greeted with a warm reception from many breeders who saw how, like stallion owners, you need to maximise you investment while you can. But the effort to get things changed – particularly internationally – seems a long way off. I doubt if it has been more than “raised”, if that. If that is the case, then I think breeders are being short-changed. More than that, I think the old arguments about what is okay for the boy but wrong for the girl are lurking in a way that a future looking industry doesn’t need. You can put good rules around anything. If you REALLY want to. It just takes effort and good will. I’d go for just allowing a mare to breed twice in a season (hey, we know it is hard enough to get one positive strike, but it would be lovely to have two options). 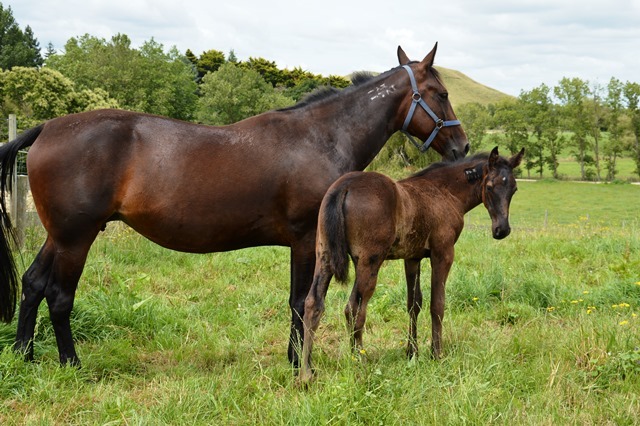 And that would be enough to double the potential breeding of each mare in New Zealand, although reality is that the cost of providing for good surrogate mares has to be taken into account and only breeders with good quality mares would probably look at the option. But isn’t that the right signal? The results for the industry would be more foals on the ground, from quality mares. And probably from more diverse sires, if the rules were set correctly. We are so used to seeing top sires dominating the progeny in one race – Bettor’s Delight, Sundon, Mach Three, etc. Why are we so adverse to seeing a mare’s name more than once on the ledger? It makes you think, eh. Anyone reading my blog will know how much I love the mares I have. This is not about “being greedy”. It is about opening our minds to think EQUALLY and FAIRLY about breeding. In the end, the choices are still (and should be) individual and personal and with some sound financial basis, and within the rules. But maybe it is time to change those rules to a more equitable situation between sires and mares. What do you think? Responses welcome to this blog. There’s relief for me as the breeder as well as for the owners and trainers when a horse I’ve bred qualifies. I really want to produce horses that race well, not just ones that get a good price at the sales. Thephantomtollbooth qualified at Alexandra Park this morning, and although he was fourth of four, it was all he was required to do. Job done. Nice qualifying win by Rock N Roll Heaven-Party Girl Becqui 2yo filly Killer Queen, while Thephantomtollbooth sticks on 4th in a 28.3 last quarter. They were all well inside the qualifying time. He’s a big handsome boy with a lot of condition on him, but Lincoln Farms like him and are prepared to take time. Sweaty and heading for his hose down. His effort today follows in the hoofprints of all his other siblings – remarkably all 7 foals of racing age from the mare Zenterfold have now qualified as 2yos (as Zenterfold did herself). She’ll get an extra carrot or two when I visit her and her Rock N Roll Heaven filly foal at Breckon Farms tomorrow. As you know I enjoy noting when a horse pops up from the last crops of our favourite sires. In the previous qualifying heat for 3yos at Alexandra Park today I was surprised and delighted to see a filly by Holmes Hanover win very nicely. The filly’s name is Wirreanda Piper, trained by Penny Fensom. 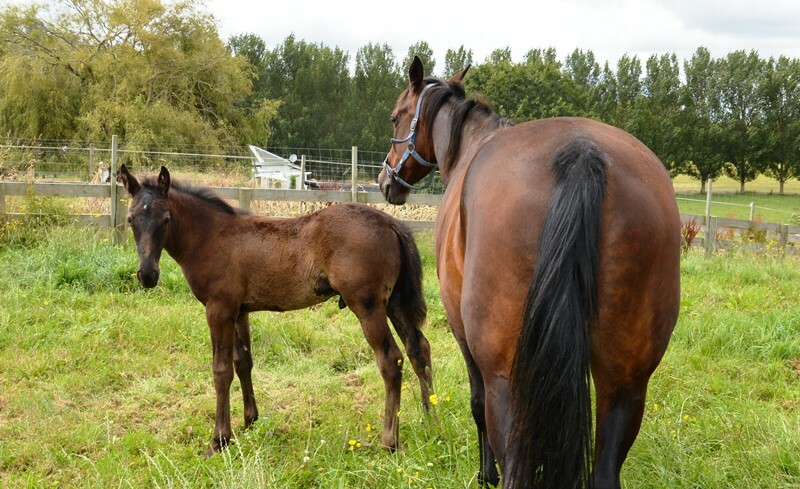 There are only 5 Holmes Hanover progeny registered in New Zealand who are 2 or 3, and 4 others unregistered. Those were the last crops of the great sire who died in 2006. 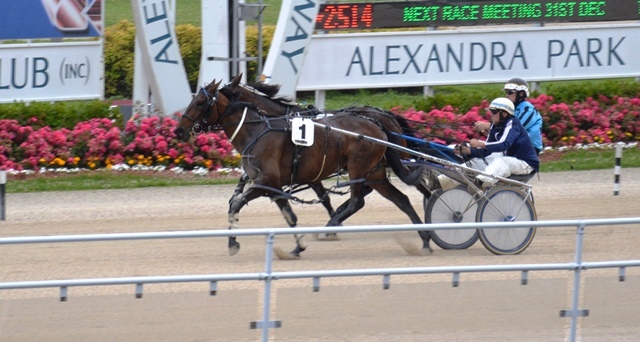 Holmes Hanover 3yo filly Wirreanda Piper winning her qualifying trial 20 December 2014.